Let’s face it—not all of us live in large homes with plenty of extra space. Instead, many of us live in tiny houses, studio apartments, or spare rooms. We don’t have a McMansion with ample room for storing all our gear, or a huge garage for our toys. Space is at a premium, which means we need to make the most of it. If this sounds familiar, you’ve probably struggled with how to store your kayak or canoe when it’s not in use. Good news: Shore Tee by FootStake is the perfect a solution. Our system is flexible, affordable, and portable, which are all important qualities when space is at a premium. To learn why Shore Tee by FootStake is the right choice for small spaces, keep reading! 1. You don’t need fancy tools to install Shore Tees. When you’re ready to use your Shore Tees, simply push them into the earth with your foot. This is great news for people who live in small spaces and might not own a garage full of tools and equipment. It’s also good for renters who move often, since the Shore Tees are portable. When it’s time to go—either to a new home or on another adventure—just pull the Shore Tees out of the earth and pack them up. They’re lightweight and easy to take along to your next destination. 2. You can use Shore Tees in almost any environment. Some storage solutions require hanging your kayak or canoe from a wall or ceiling. This can be tricky when you don’t have a lot of space to spare, or if you’re renting. No one wants to hit their head while eating dinner, or walk into a kayak when they’re trying to get to their bed. Shore Tees avoid this problem by allowing you to store your kayak or canoe outside. A carport is an ideal spot, since it’ll also be protected from the weather, but you can just as easily store your boat along the side of your house, garage, or shed. 3. You can afford Shore Tees, even if you’re saving up for a bigger place. Quality and convenience often mean a higher price tag. Not so for the Shore Tee by FootStake! This clever storage system clocks in at a cool $59.99. Great news for those of us who are saving up for a bigger space—or a new kayak. Priorities, right? 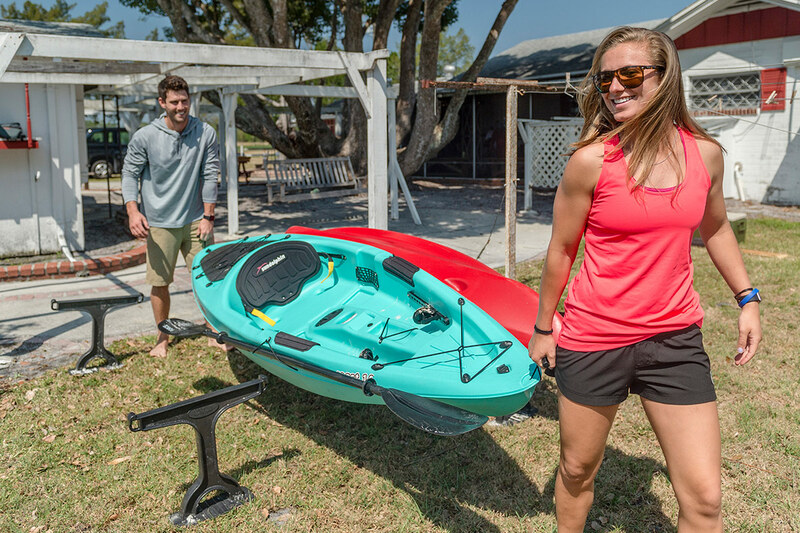 We hope this post has convinced you that a kayak or canoe storage system is possible, no matter how much (or how little) space you have. Want to show off your Shore Tee set up? Tag us on Instagram and we’ll share your best photos.